Muffins & Cupcakes: Why they are different. | Curious Foodie. « What If You Only Had These 12 Ingredients In Your Kitchen? This entry was posted on February 20, 2008 at 1:23 pm and is filed under Baking, Discussion. You can follow any responses to this entry through the RSS 2.0 feed. You can leave a response, or trackback from your own site. Spooky thing – I just made white chocolate muffins today! Babe, you know what, after baking for so long, and eating so many cupcakes and muffins, I still cannot explain their differences. Your post makes it really easy to understand and remember. Cupcake = cake, muffin = bread, and the rest of the differences will fall into place. Rosie: Thanks! 🙂 Mmmm sounds like delicious muffins, gosh I haven’t baked for a while now. bodytreats: Glad I managed to help my dear, yes to baking! It surely de-stresses. Nice explanation!! But what really matter is that both are damn yummy!!! I do really like your description. Although, it is so often broken. I’ve had many a muffin that is more of a cake than a bread. He/she mentioned that muffin is a quick bread (like brownie), not bread-bread. Quick bread is a mixture of leavening agents and yeast, not just yeast alone, which explains the texture difference compared to bread. While cupcake is just a smaller whole cake with the same texture. A quick bread does not have yeast, that is why it is a quick bread. the leavening agent requires no time to rise as it does so while cooking, whereas yeast bread must be risen before it is baked. Stef: I like your second post on steaming cupcakes, its cool! Next time I’ll try and let you know how it turned out. 🙂 Thank you for the links. Hi, thanks for the explanation, I wanted to know the difference. I am from Chile and we usually make big cakes, not individual cupcakes or muffins. I want to ask you something about the recipe. I make cakes since I was a little girl and my recipe has been: you mix a cup of sugar with a little of oil, then you add two eggs and beat it very well; then you pour two cups of sift flour and one spoonful of baking soda and beat it. I add half cup of milk to the mix, I think that is optional, but that soften the mix a little. My family likes the cake that way, but I prefer it a more crumby and soft, like cupcakes. How do you make them? Yesterday I tried to make cupcakes with four eggs instead of two, only one cup of flour, half cup of butter and one grated apple with cinnamon. First they were very high but then it started to low, and they got plane. Strictly speaking, muffins are not bread at all, contrary to popular belief. bread is made from dough. Cake is made from batter. It matters not whether the end product is sweet, if it’s made frm batter, it’s cake. Even some things we traditionally call “bread, ” such as banana bread, pumpkin bread, zuchini bread, and yes, even cord bread and quick bread, are all batter based, and therefore, cake. The difference between muffins and cupcakes is the kind of flouer used and the amount of fat used. Most traditional cakes are made with fine cake flour, where as muffins and other “quick breads” are usually made with an all-purpose flour. Yes, I know, we have all used all-purpose flour in our cake recipes, too, but we usually mix it at higher speeds and this has a tendency to smooth out the batter and increase the effects of the gluten in the flour. Muffins are made with all-purpose or “baker’s flour” and are hand mixted to a sometimes lumpy batter. There is also a much higher fat content in muffin batter. A pan of 6 huge or 12 medium-sized muffins might require a whole stick of butter or more, as well as some milk or cream. So, call it what you like, but if it comes from batter (even if it’s shaped like a muffin or a loaf) it’s still technically cake. now what are the muffin cupcake hybrids at resturants like famous dave’s for example? What would you call that? It’s kinda cake like, it crumbles like a cake but doesn’t strike me as a cupcake its kinda sweet but i dunno if id decorate and frost it up. … and can I have a cupcake with my tea? … Pretty Please… Does that make it a muffin? The best way for me to get clarification is to see a basic or same flavored muffin/cupcake recipe that would yield the same amount of product. For instance a chocolate muffin vs a chocolate cupcake that both yield the same amount. Thanks for your sharing. Now I have a clear thoughts of cupcake and muffin. tks for your post, im trying to share it in chinese, hope u dont mind. I decided to research this today just to read what others have written about it. My conclusion…the difference comes down to ingredient quantities and preparation. Everything else is irrelevant and largely subjective. I have used the same types of ingredients in both types of recipes (muffin and cake/cupcake)…including oils, butter and several different types of flours. The only consistent difference: the amounts of each ingredient, and somewhat less, the method of preparation. I just want to say that, while I find your descriptions helpful, there are a few things that don’t really serve as differenciators. 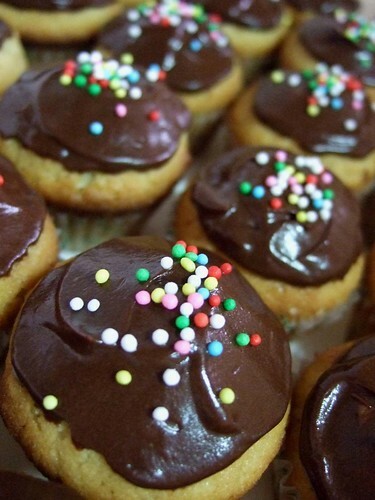 As a vegan who bakes a lot, vegan cupcakes do use oil, and no butter; so these 2 points are not really universal differenciators between muffins and cupcakes. Thank you for your kind words Sue 🙂 Take care. Muffins & Cupcakes: Why they are different. « Curious Foodie…. Hey I need to do science project on cupcakes using different oils like sunflower canola vegetable and saffola oil can yu give me some research please thank you brittney. My wife bought M&S Muffin recipe book last week. Total disappointment. Not those big shop “muffins” but solid texture. Seems double flour and loads of liquid doesn’t equate with light airy results! So if you want a shop-type muffin, cook cupcakes or fairy cakes as we used to know them. So if I bite into a bite-sized cake-like buttermilk bread type cupcake then I might call it either a cupcake or a muffin. Looking for information on Cupcake Recipe Books? Visit my website at http://www.easycupcakerecipes. The muffins I know are entirely different to the things that you describe as muffins. They are flat, round and made of a bread mixture. I have known muffins all my life in the United Kingdom (I am 66) and they are still widely available. They are, of course, called muffins, not English muffins. American muffins (the things like cup cakes) have only appeared in this country relatively recently, through American coffee shops, fast food chains and the like, and like so many other American terms ‘muffins’ is now taking over from its original meaning here and edging out our terminology almost altogether. I did some research on muffins and found that they date back at least to the 10th century. How did Americans come to give this name to a more recent product that is entirely different?As I said, in England they are known as muffins, not English muffins. I have heard that what Americans call ‘English Muffins’ are in fact crumpets, also very popular. Crumpets and muffins are about the same size, but that is the only similarity. Crumpets are made with a sort of batter mixture. They are very light and have lots of holes in the top side (good for letting butter soak into). 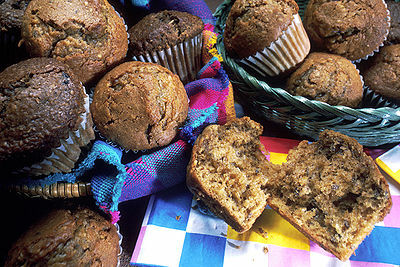 Muffins are made with a bread mixture. They are heavier and more dense than crumpets. They do not have holes in them. are different. | Curious Foodie. <Loved it!